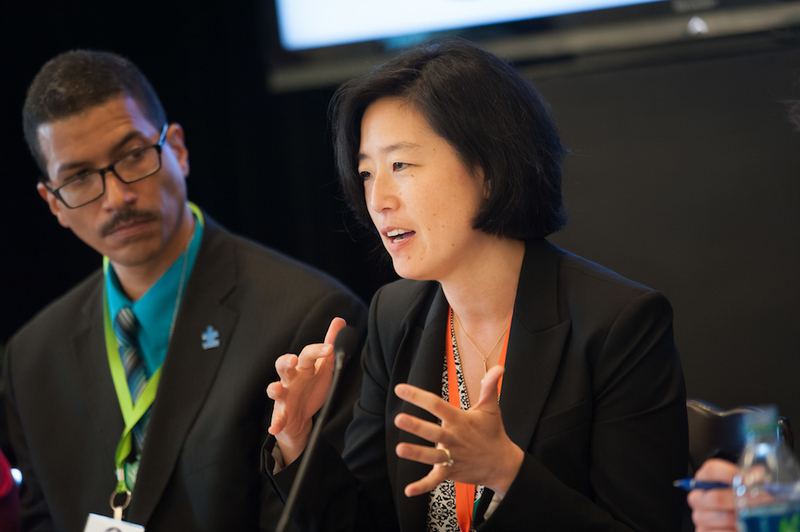 Ishimaru is principal investigator for the Family Leadership Design Collaborative, a national effort to redesign family engagement in education for community wellbeing and justice. Launched in 2015, the participatory design-based research project brings together researchers, educators, parents, families and communities across the country to develop better ways for various stakeholders to interact with one another and make decisions about their children’s education. The FLDC currently is developing a series of research briefs and tools to support those interested in a new model of family engagement. In the next phase of its work, the FLDC will launch deep dives in three sites for in-depth work designing tools, practices, measures and policy to enact more equitable pathways for family engagement in education. Ishimaru also works to identify equitable leadership practice and support organizational learning and growth toward equity in P-12 schools and educational organizations. That work has been instrumental in shifting national educational leadership standards to include a focus on equity and cultural responsiveness. Mia Tuan, dean of UW College of Education, said Ishimaru’s work exemplifies how deep partnerships between researchers, practitioners and communities are needed to co-design sustainable solutions to the most pressing issues in education. The award is presented to an education scholar or scholars in recognition of collaborative projects between researchers and practitioners that have had sustained and observable effects on contexts of practice. Award recipients lead efforts in which research-practice partnerships are integral to addressing challenging issues in education, constructing research-based innovations and taking the work’s impact beyond a single program or site. Ishimaru, an assistant professor of educational policy, organizations and leadership who teaches in the UW’s Leadership for Learning (EdD) program, received the University Council for Educational Administration’s 2016 Jack A. Culbertson Award in recognition of her significant contributions to the field of educational leadership. Her article offering guidance to school leaders on how to close opportunity and achievement gaps among students, "Beyond Individual Effectiveness: Conceptualizing Organizational Leadership for Equity," was honored as the most read article of 2014 in the journal Leadership & Policy in Schools. Ishimaru will be honored during the AERA’s annual meeting in San Antonio later this month and serve as discussant during the session “Co-Designing Family and Community Wellness and Educational Justice: Findings From the Family Leadership Design Collaborative” on April 29.